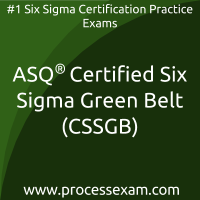 You can easily pass ASQ Six Sigma Green Belt (CSSGB) Certification with the help of our online practice exam. We are here to help you every step of the way to pass your Certified Six Sigma Green Belt exam. Our team of experienced and certified professionals with more than 12 years of experience in the field of Business Process Improvement has designed practice exam to prepare for ASQ CSSGB certification. They have carefully maintained exam structure, syllabus, time limit and scoring system same as the actual ASQ Certified Six Sigma Green Belt exam. Our ASQ CSSGB question bank contains most frequently asked and real-time case study based questions prepared by collecting inputs from recently certified candidates. To get familiar with our online ASQ Six Sigma Green Belt certification practice exam environment, we invite you to try our sample practice exam to build the trust between us. All the questions covered in sample practice exam are basic Certified Six Sigma Green Belt Certification exam questions. To test your knowledge and understanding with the real-time case study based questions, we strongly recommend you to practice with our Premium ASQ Six Sigma Green Belt (CSSGB) practice exam. 430+ Practical and Real-time Case Study Based Practice Exam Questions similar to actual ASQ CSSGB certification exam and their correct answers for assessment. 2 Months Unlimited Access to online Certified Six Sigma Green Belt (CSSGB) certification practice exam. We have a dedicated team of ASQ certified experts who are having more than 12 years of experience in the field of Business Process Improvement. Our structured and autonomous review system collects feedback from recently certified candidates, based on those inputs our domain experts frequently update ASQ Six Sigma Green Belt test questions for practice. Our online practice exam is a simulation of the actual ASQ Certified Six Sigma Green Belt exam that makes you familiar with actual exam environment and exam pattern. We offer unlimited practice attempts with our online practice test. Every attempt randomly populates questions from our premium ASQ CSSGB question bank that contains 430+ most probable case study based questions prepared by our domain experts. Practice questions will be served in random order with shuffled multiple choice answers to make your Certified Six Sigma Green Belt exam experience more challenging. You can review the results of past practice attempts from result history and assess your performance. Such facilities are the significant advancement over questions in CSSGB PDF and far better than fraud dumps sites. According to our survey with ASQ CSSGB Certified candidates, you can easily score 80% in the actual ASQ Certified Six Sigma Green Belt exam if you can score 100% in our online practice exam. People who have already cleared ASQ Six Sigma Green Belt Certification are always in a better position to recommend. I solved my doubts in Design for Six Sigma (DfSS) Methodologies and Voice of the Customer (VoC) topics with the help of mock tests online. They are superb. I knew that ASQ CSSGB mock tests would be a great resource material because it gave me positive vibes. I scored well in the ASQ Certified Six Sigma Green Belt actual certification exam and all the credit goes to the processexam questions. I was quite nervous about the audit process topic in CSSGB syllabus. I didn’t know much about Project Identification, Project Management Basics, and the likes! However, Certified Six Sigma Green Belt mock tests helped me get over my anxiety through the right preparation method. By searching the internet for a few hours, i landed on this processexam site. It is quite well known for ASQ CSSGB mock tests. Full of questions to practice for ASQ Six Sigma Green Belt certification questions, i felt like i m a lucky person. I did give a demo test and signed up for the premium membership. This is my best decision ever.